Overkill: Feared Blackwater Mercenaries Deploy in New Orleans | Democracy Now! 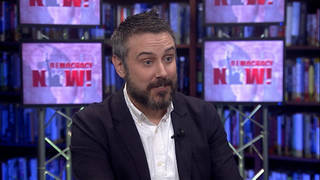 Jeremy Scahill, Democracy Now! producer and correspondent. AMY GOODMAN: Meanwhile, in New Orleans it is a militarized zone. When we came into the French Quarter on Saturday, we met some, well, interesting people. AMY GOODMAN: Did you just get here? BLACKWATER MERCENARY 1: We have been here a couple days. AMY GOODMAN: Yeah? Who are you working for? AMY GOODMAN: And who are they working for? BLACKWATER MERCENARY 1: Really don’t — don’t have any way to tell you that. You know, we just do our assignments, and we go from there. AMY GOODMAN: What’s your assignment today? BLACKWATER MERCENARY 1: I’m not at liberty to discuss. I’m sorry. AMY GOODMAN: Have any of your guys just come back from Iraq, by any chance? BLACKWATER MERCENARY 1: Last year. BLACKWATER MERCENARY 2: Last year. Who are you guys with? JEREMY SCAHILL: That’s right, Amy. And the Blackwater mercenaries became very well known internationally a few years back when four of their men were killed in Fallujah, Iraq. Two of them had their bodied burned and then hung from a bridge. And that resulted in the massive retaliatory onslaught against Fallujah that resulted in tens of thousands of people having to flee the city and scores of people being killed, and now Fallujah has become an international symbol of resistance, and that goes back to those killings of the four Blackwater workers. And so, we tracked them down, found them down the street, and just approached the Blackwater mercenaries and began talking to them. Two of the guys that we talked to had served on the personal security details of L. Paul Bremer, the American pro-counsel in Iraq originally, the head of the occupation, as well as the U.S. ambassador — former U.S. ambassador to Iraq, John Negroponte. One of the guys had just gotten back from Iraq two weeks ago. These are some of the most highly trained killers, professional killers in the world. And they had served in Iraq in a number of cities and in a number of capacities. And one of them was wearing a golden badge, that identified itself as being Louisiana law enforcement, and in fact, one of the Blackwater mercenaries told us that he had been deputized by the governor of Louisiana, and what’s interesting is that the federal government and the Department of Homeland Security have denied that they have hired any private security firms, saying that they have enough with government forces. Well, these Blackwater men that we spoke to said that they are actually on contract with the Department of Homeland Security and indeed with the governor of Louisiana. And they said that they’re sleeping in camps organized by the Department of Homeland Security. One of the Blackwater guys said that when he heard New Orleans, he asked, “What country is that in?” And he was bragging to me about how he drives around Iraq in what he called a State Department issued level five explosion-proof BMW. This, as U.S. soldiers don’t even have proper armor on their Humvees and other vehicles. And so, we also overheard one of the Blackwater guys talking to, we presume, a colleague, complaining that he was only being paid $350 a day plus his per diem, and that other firms were paying much more. And we’re seeing many of these Blackwater mercenaries and other private security agents roaming the streets of New Orleans. And what’s significant is that the way it’s being reported and the way the company is presenting it is that they are here to help with the hurricane relief efforts, but they told us clearly that they are engaged in quote, “stopping criminals” and that they’re actually patrolling the streets. In fact, we saw them take over a building on Bourbon Street when we were walking around with them. And now they have set up shop there on Bourbon Street in the French Quarter. So this is very, very disturbing, I think, for anyone who knows the record of Blackwater. Of course, they do not ask questions first. They shoot first, and that is their reputation in Iraq. And so, Americans should be asking right now what these kinds of trained killers are doing on the streets of New Orleans, apparently on contract from the Department of Homeland Security. AMY GOODMAN: And Jeremy, as we went around, saw other figures, we didn’t know who they worked for, like those in front of Hibernia Bank, as we were driving by and John Hamilton was filming. They flagged down our car. They said, “Stop the filming.” And we said, “Why?” And they said, “We just said 'stop the filming. '” They said, “These are our streets,” and made clear next to their sports shirt, you could see clearly that they were carrying guns. JEREMY SCAHILL: Yes, that’s right. And they also alleged that they had been deputized. And another key point is that these Blackwater guys said that they were given the authority to use lethal force, as well as the power to make arrests. And when we asked them about this use of them in the United States, they said that they believe that we’re going to see a lot more of this and that this is a trend. So, I think that this is a very, very disturbing development that we are seeing here on the streets of New Orleans, Amy. AMY GOODMAN: Well, if you want to read “Overkill” by Jeremy Scahill and Daniela Crespo, go to our website at DemocracyNow.org.